Bradykinin is a potent vasoactive peptide created when Factor XII activates kallikrein, which then cleaves high-molecular-weight kininogen (HMWK) into bradykinin. Bradykinin then leads to a release of prostacyclin, nitric oxide, and other vasodilatory signals. [1-3] C1 esterase-inhibitor (C1INH) normally regulates the production of bradykinin at numerous steps in the pathway, particularly blocking the catalytic function of activated factor XII and of activated kallikrein (Figure 2). HAE is inherited in an autosomal dominant pattern and is due to C1INH deficiency (85% of cases) or C1INH dysfunction (15% of cases). Acquired angioedema is due to C1INH consumption via autoimmune processes. ACEI-AAE is due to blocking bradykinin degradation via kininase I and kininase II (aka ACE). All patients presenting with angioedema should be initially treated as if histamine-mediated. Concurrently, assessing for bradykinin-mediated angioedema risk factors should take place. The primary clinical differentiation between histamine-mediated and bradykinin-mediated is, in the latter, the absence of urticaria and pruritus but presence of gastrointestinal distress. Hereditary angioedema is more likely to present in a patient with a known family or personal history of angioedema and possibly with a recent trigger such as trauma or infection. ACEI-AAE occurs in 0.1%-0.7% of the 40-million+ patients on ACEI; it accounts for 25%-40% of all angioedema ED visits per year and typically occurs early on in treatment course, but can be at any time point. [4,5] Acquired angioedema is much less common and often presents in association with a B-cell lymphoproliferative disease. As aforementioned, angioedema cases should be initially triaged and treated as histamine-mediated conditions until more data arises that indicates otherwise. 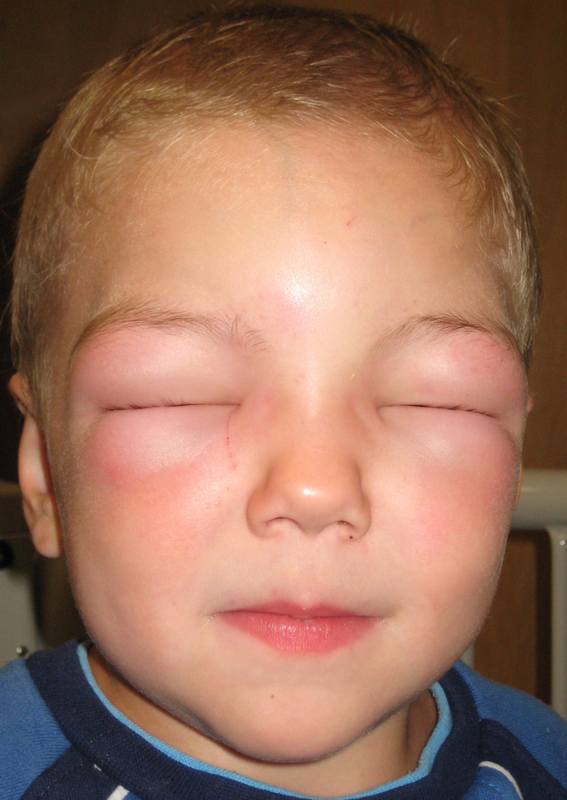 Regardless of etiology, airway compromise is the most emergent concern with persons experiencing angioedema. If a definitive airway is required, the most experienced provider will need to follow a difficult airway algorithm. 1. Chiu, A. G., A. R. Burningham, K. A. Newkirk, E. J. Krowiak, B. J. Davidson, and Z. E. Deeb. "Angiotensin-Converting Enzyme Inhibitor-Induced Angioedema: A Multicenter Review and an Algorithm for Airway Management." Annals of Otology, Rhinology & Laryngology. 110.9 (2001): 834-40. 2. Bas, M., V. Adams, T. Suvorava, T. Niehues, T. K. Hoffmann, and G. Kojda. "Nonallergic Angioedema: Role of Bradykinin." Allergy. 62.8 (2007): 842-56. 4. Banerji, Aleena, Sunday Clark, Michelle Blanda, Frank Lovecchio, Brian Snyder, and Carlos A. Camargo. "Multicenter Study of Patients with Angiotensin-converting Enzyme Inhibitor-induced Angioedema Who Present to the Emergency Department." Annals of Allergy, Asthma & Immunology. 100.4 (2008): 327-32. 5. Toh, Sengwee, Marsha E. Reichman, Monika Houstoun, Mary Ross Southworth, Xiao Ding, Adrian F. Hernandez, Mark Levenson, Lingling Li, Carolyn Mccloskey, Azadeh Shoaibi, Eileen Wu, Gwen Zornberg, and Sean Hennessy. "Comparative Risk for Angioedema Associated With the Use of Drugs That Target the Renin-Angiotensin-Aldosterone System." Arch Intern Med Archives of Internal Medicine. 172.20 (2012): 1582. Lipski, Samuel Michael, Georges Casimir, Martine Vanlommel, Mathieu Jeanmaire, and Pierre Dolhen. "Angiotensin-converting Enzyme Inhibitors-induced Angioedema Treated by C1 Esterase Inhibitor Concentrate (Berinert ® ): About One Case and Review of the Therapeutic Arsenal." Clinical Case Reports Clin Case Rep. 3.2 (2014): 126-30. 6. Nielsen, E. W., and S. Gramstad. "Angioedema from Angiotensin-converting Enzyme (ACE) Inhibitor Treated with Complement 1 (C1) Inhibitor Concentrate." Acta Anaesthesiologica Scandinavica. 50.1 (2005): 120-22. 7. Bernstein, Jonathan A., Joseph J. Moellman, Sean P. Collins, Kimberly W. Hart, and Chris J. Lindsell. "Effectiveness of Ecallantide in Treating Angiotensin-converting Enzyme Inhibitor–induced Angioedema in the Emergency Department." Annals of Allergy, Asthma & Immunology. 114.3 (2015): 245-49. 8. Baş, Murat, Jens Greve, Klaus Stelter, Miriam Havel, Ulrich Strassen, Nicole Rotter, Johannes Veit, Beate Schossow, Alexander Hapfelmeier, Victoria Kehl, Georg Kojda, and Thomas K. Hoffmann. "A Randomized Trial of Icatibant in ACE-Inhibitor–Induced Angioedema." N Engl J Med. 372.5 (2015): 418-25. 10. Saeb, Aya, Karen H. Hagglund, and Christine T. Cigolle. "Using Fresh Frozen Plasma for Acute Airway Angioedema to Prevent Intubation in the Emergency Department: A Retrospective Cohort Study." Emergency Medicine International. 2016 (2016): 1-6. 11. Hassen, Getaw Worku, Hossein Kalantari, Monica Parraga, Roger Chirurgi, Carlos Meletiche, Christopher Chan, Jacque Ciarlo, Farhad Gazi, Christopher Lobaito, Siamak Tadayon, Selamawit Yemane, and Carolina Velez. "Fresh Frozen Plasma for Progressive and Refractory Angiotensin-Converting Enzyme Inhibitor-induced Angioedema." The Journal of Emergency Medicine. 44.4 (2013): 764-72.